Deep Spelle, Cucumbers, Dario D&apos;Attis, Ben Mono, Dаrlyn Vlys and more. 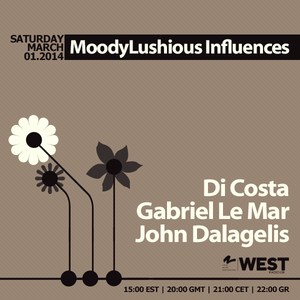 This is the March installment of &apos;MoodyLushious Influences&apos; for 2014, aired on West and Deepvibes radios this weekend. Discover a selection of some of my most preferred titles for the past month picked with the sole purpose of dragging more attention this time to a slightly different and more underground perspective that have remained somehow in the shades on my sets lately. I&apos;ve been willing to give that sound a shout a lot so this is what came out of that urge. Hope you&apos;ll enjoy it! Note : Check my Soundcloud profile for clean version of the mix which is also downloadable for free of course.